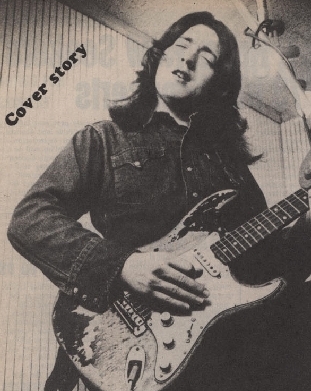 RORY GALLAGHER WAS VOTED THE WORLD'S No 1 GUITARIST IN THE MELODY MAKER'S ANNUAL SHOWBIZ POLL RECENTLY. And it's easy to say we told you so. Sure, everybody knew that Gallagher had it in him. He used to sleep with that battered guitar in the bed with him, its paint flaking off. And it wouldn't have surprised us to hear that he used his amp as a pillow. 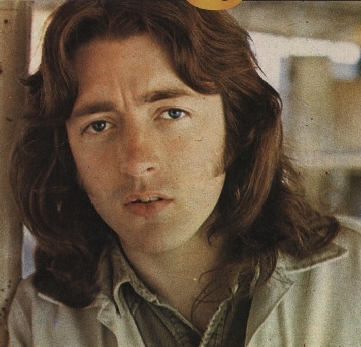 Rory Gallagher, for as long as we knew him, has been interested in only one thing - music. Chicks, birds, women, girls and groupies were in a different world as far as he was concerned. Heroin, cocaine and acid might have been big influences on the lives of other musicians, but Rory didn't even want to know. Pot, hash, cannabis meant nothing to him. He didn't even smoke cigarettes. And as for drink - he sipped Guinness by the half pint. But to talk to the quiet Corkman about music and his face lit up. He had n open mind about it. He'd listen to everything, but he knew what he wanted to do himself. He knew what his roots were - not the Clippers or Johnny Quigley, but American blues. And he knew where he was gong - gradually developing a style to go with his talent. Rory has come a long way since playing with the Axills. He's come a long way from the first- original-Taste, from Cork. He's come a log way from that first Major Minor single - a sloppy version of 'Blister on the Moon'. Now he has more albums released than Morrison. Now he's part of Polydor's Pop History. Rory Gallagher's name is up there in lights and it's gonna stay that way for quite a while. Success came hard to the man who was born in Donegal and brought up in Cork. There was a lot of sleeping-in-the-van in the early days. And there was a lot of traveling from Cork to play a gig in Belfast for £12. Nowadays you need to add two noughts onto the end of that to get near to his current fee. Taste had to slog hard to break through in England. The endless gigs in the Marquee where originally the band had to pay the management for the privilege of gracing their famous stage....The long drags through the Continent, shipping themselves over on ferries and driving for twelve hours at a stint. Rory first began to attract real attention on the Continent. Germany, Holland, Belgium - it was in countries like that where he first became regarded as a superstar. The English fans were not in a great hurry to honour him but they came round to it eventually - at the Isle of Wight Festival which, ironically, signaled the end of Taste. John Wilson and Richie McCracken split, Rory mused around Cork and took an odd Guinness with his friends. He was taking it easy. He almost looked lazy for a while....and then, wham bang, he was off again like a delayed action firework. In no time he has a brilliant solo album released and a new band on the road. The band has seen changes since then, but Rory has held his head above it all. The Queen Elizabeth hall by the Thames rocked to applause during a mammoth Gallagher concert there and then, reassured, Rory began his onslaught on America. That's where he's been for the past few months. Storming the States. Playing a tour that gets longer and longer. The Yanks don't want to let him go, the greedy bastards. First they took Morrison and now they've taken a shine to Gallagher. The English realised what was happening before we did. They voted him No.1 Guitarist in the hope he'd come back and say Thank You. The Irish had better do the same or we'll have lost him. Rory Gallagher will be at home over Christmas - he'll be playing a series of dates and the crowds will flood him out. But everybody who goes to see Rory at Christmas will be thinking about one thing.....When is he coming back?